A new spin on Irish soda bread! 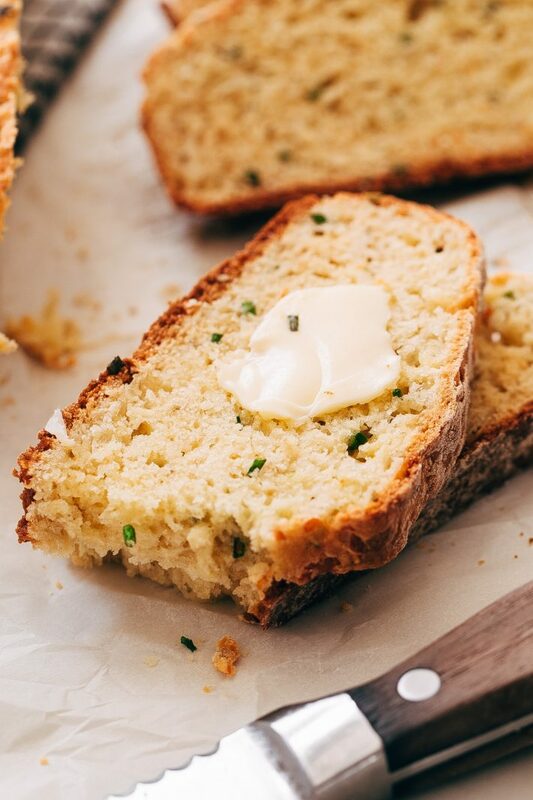 My Cheddar chive soda bread is flavored with garlic, tons of Irish cheddar, and freshly chopped chives. Serve it with a smear of butter or with a bowl of stew! Would you look at that golden brown crackly crust? 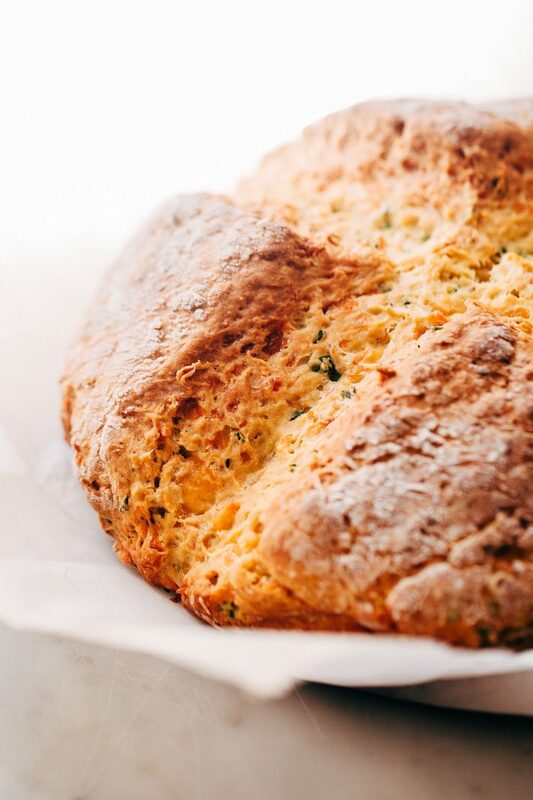 My Irish cheddar chive soda bread isn’t like anything you’ve had before. 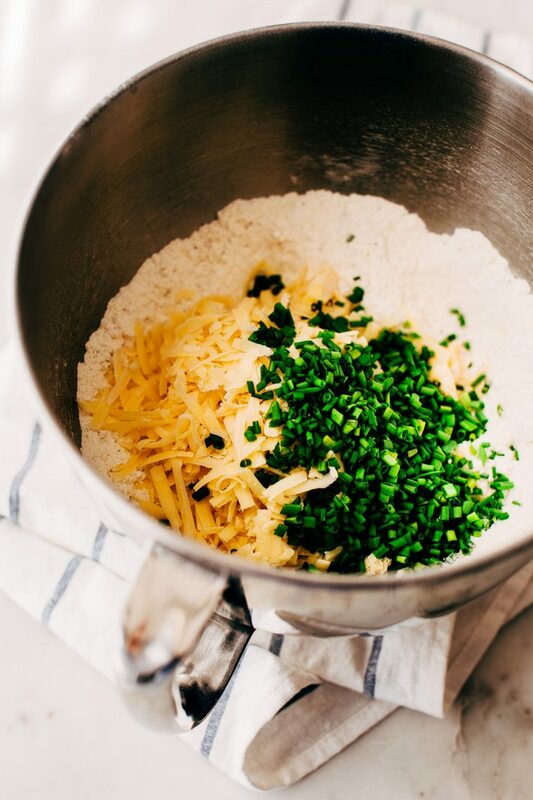 Picture this: warm, inviting smells of garlic, savory, aged cheddar cheese, and fresh chives wafting through the house as the dough slowly rises in a hot oven. It’s the hardest thing to sit still and focus on work when those pleasant cheesy, garlicky smells are making their rounds. Making bread is something I’ve started feeling more comfortable with over the last couple of years. I’ll still have extreme anxiety when I start recipe testing anything that uses yeast, but it’s a lot more controlled than it used to be. 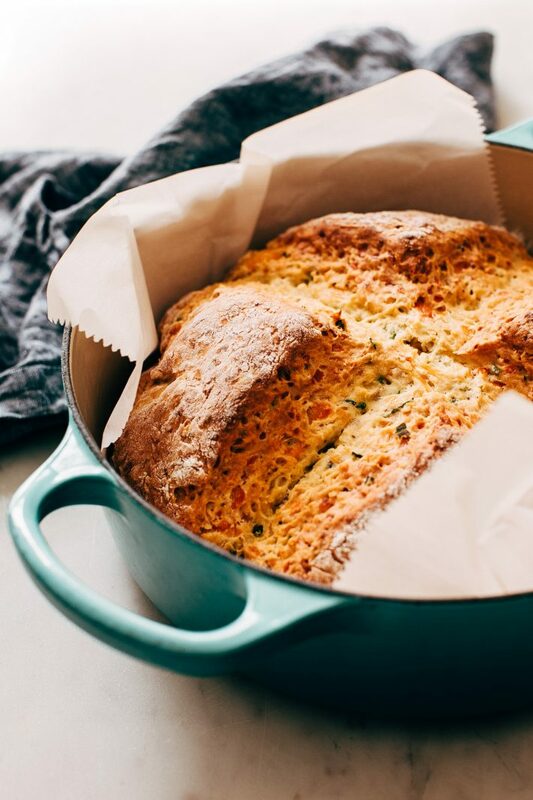 The one really big motivating factor to give this cheddar chive soda bread a try is that you don’t work with yeast at all here. That means we’ll eliminate the proofing process. It’s as simple as mixing the bread dough in a bowl, placing it on a lined baking sheet or a dutch oven, and baking it. Potential carb overloading just got a whole lot easier. 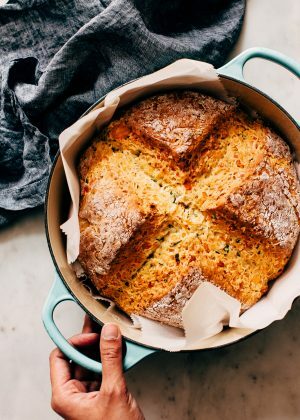 In the past, I’ve shared a cheddar caraway Irish soda bread , but of the two I’d say this cheddar chive soda bread is my favorite. Did I mention it has GARLIC? Do I even need to tell you why I prefer this one more? I know, typically when you hear the words ‘Irish soda bread,’ you think the more traditional version with currants or raisins or maybe even cranberries. A hint of orange zest to brighten the whole thing up and a little schmear of butter. A sweet affair. 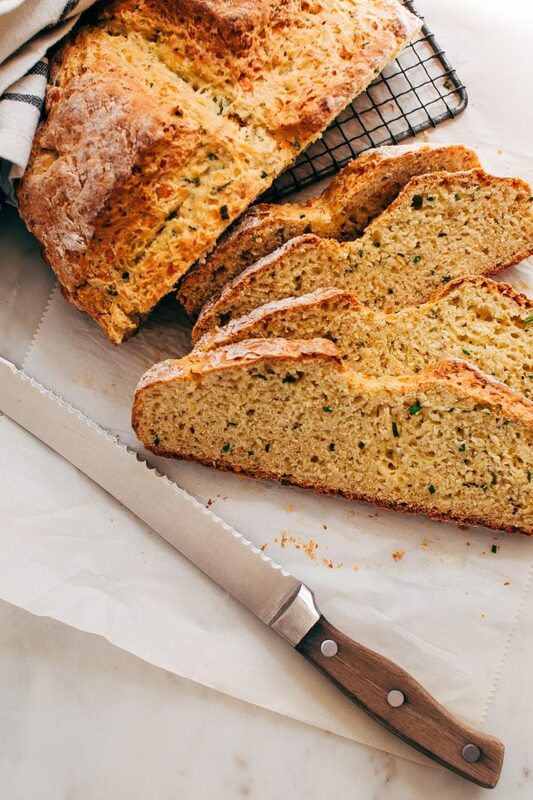 The last time I made soda bread, I mentioned how I wanted to try it with herbs, and though I didn’t go the rosemary route I thought I would, I love the flavors that garlic and chives bring to this bread. That reminds me, have you made my garlic cheddar and chive scones ? If you have, you’ll love this soda bread; if you haven’t, made this it’s even easier! Let’s talk about the process of baking soda bread. You’re going to start with the dry ingredients in a stand mixer. Just let it go on the stir setting, so the baking soda, baking powder, flour, salt, pepper, sugar and garlic powder have a chance to mix. If you don’t have a stand mixer, don’t worry, you can also do this by hand. Once the dry ingredients mix, we’ll cut in the butter. This works using a paddle attachment, or you can use a pastry cutter  (affiliate link.) Once we’ve done that, we’ll stir in the cheddar cheese and chopped chives. Now it’s time to bring the bread together. You’ll need an egg and buttermilk. It’s important to use buttermilk in this recipe and not regular milk. It’s the reaction between the baking soda and buttermilk that gives Irish soda bread its name. This takes me back to my food science classes I took in college! Nerd alert: it was my favorite class in all of my university years! I want to mention; if you don’t have buttermilk, you can use a few teaspoons of vinegar with regular milk and allow it to stand for 5 minutes before using it in the recipe. Though this will work, I find that store-bought buttermilk produces significantly better results. 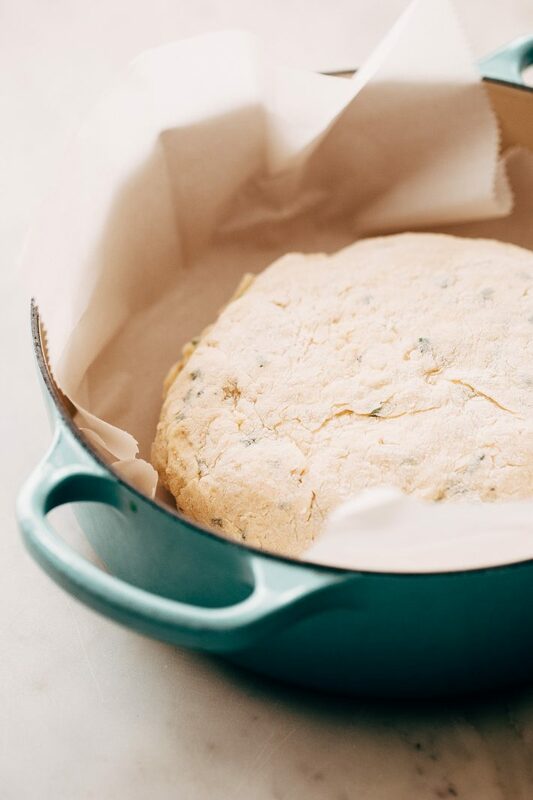 Once the cheddar chive soda bread dough comes together, pop it into a parchment lined dutch oven, a cast iron skillet, or onto a baking sheet. Just be sure to make an ‘x’ on top. This helps cook the bread more evenly. 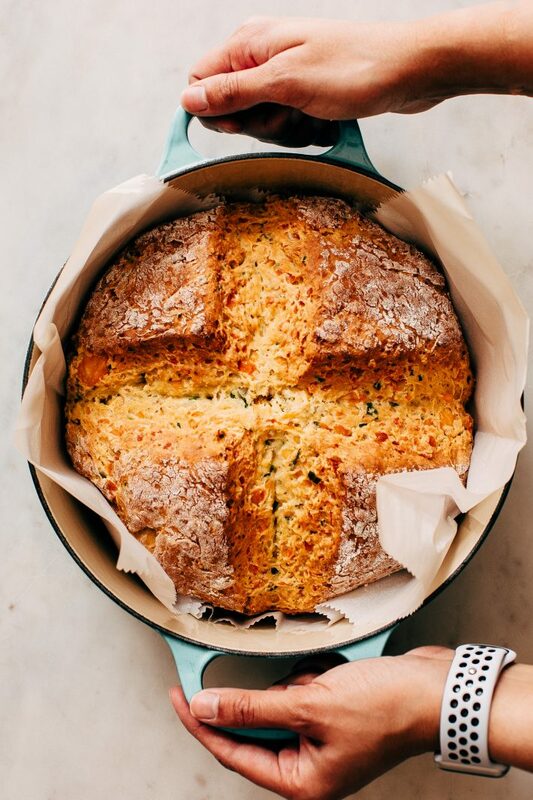 If you’re thinking of ways you can serve my cheddar chive soda bread, let me help you out. Have you made my beef stew  yet? Or maybe you’re more of a beef and barley soup  kind of person. I served my soda bread with a random chicken, poblano and corn chowder I was recipe testing at the time, and it hit the spot. So really, serve it however you like! I shared most of this bread with family and friends because I still can’t be trusted around a whole loaf of bread and unanimously, everyone loved it. Keep in mind though that soda bread usually won’t last as long as bread leavened with yeast, so it’s best if consumed within two days. The good thing is that it takes minutes to toss together so you can make it all the time! Position a rack in the center of the oven and preheat the oven to 375ºF. Line a dutch oven, a cast iron skillet, or a 9-inch baking pan with a sheet of parchment paper, set aside. In the bowl of a stand mixer, combine 3 ¾ cups of flour, oats, baking soda, baking powder, garlic powder, salt, pepper, and sugar on the stir setting. Add the cold butter and let the machine break the butter down into small, pea-sized pieces. You can also do this by hand using a pastry cutter. Add the cheddar and chives, let the machine stir for just a few seconds until mixed. In a large measuring cup, combine the egg and buttermilk. With the mixer on the stir setting, slowly pour in the wet ingredients until the dough comes together, about 30 seconds. If the mixture still looks super wet, add 2 tablespoons of flour and dump the dough out onto a well-floured surface. Use your hands to shape the dough into a large disk. If the dough is still wet, add the remaining 2 tablespoons of flour and shape it. Place the dough on the prepared baking pan and cut an ‘x’ across the top, slicing about 1/2 way through the loaf. Bake for 50 minutes – 1 hour or until the bread is golden brown on top. Insert a skewer into the center of the bread and if it comes out clean, the bread is done. Let cool for 15 minutes before slicing. DIY buttermilk – add 4 teaspoons of vinegar into a measuring cup and add enough milk to make 1 ½ cups. Let stand for 5-7 minutes before using. Though this will work, I find that store-bought buttermilk produces significantly better results. Bread will stay fresh for up to 2 days. Bread made using baking soda for a leavening agent generally dry out much faster than yeast breads.